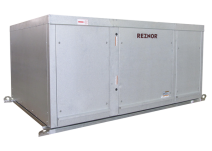 The Reznor® Model RBL is a packaged air handling unit, consisting of a blower/filter cabinet and twin centrifugal blowers. 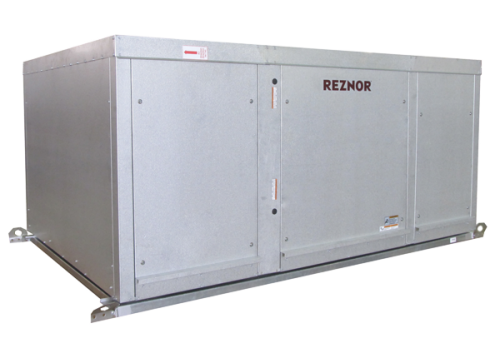 This unit has been engineered for use with Reznor duct furnaces when design considerations do not permit the use of a Reznor packaged system. The cabinet is weatherized with an integral curb cap base for outdoor installation, but may also be installed indoors. The blower cabinet has a standard horizontal discharge air opening. A bottom discharge air opening is available with the addition of an optional downturn plenum. The blower cabinet has a standard horizontal inlet but is engineered to allow for the standard horizontal and/or an optional bottom air inlet with various optional damper control systems. To obtain the desired CFM, a selection of motor and drive combinations are available. The optional filter rack will accommodate either 2” disposable, permanent or pleated filters. Pressure drops for each type of filter are listed on the following pages. To meet a variety of installation requirements, the Model RBL blower cabinet is available with the addition of downturn plenum and/or an outside air inlet hood or evaporative cooling module. The downturn plenum cabinet is a factory-installed option; the outside air hood and evaporative cooling module are shipped separately for field installation. An optional 16” full roof curb is available for cabinets both with or without a downturn plenum.